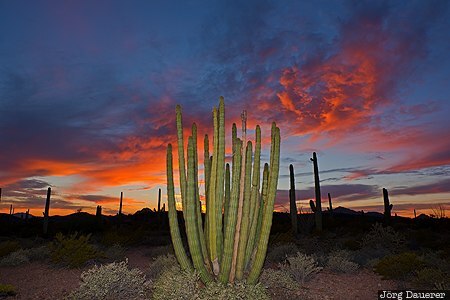 A colorful sunset sky behind a lone organ pipe cactus (Stenocereus thurberi) in Organ Pipe Cactus National Monument.The cactus itself is partially illuminated by a flash gun (used as a fill flash). Organ Pipe Cactus National Monument is near Ajo in the south of Arizona, United States. This photo was taken in the evening of a sunny day in January of 2015. This photo is part of the exhibition Fill Flash (June 2016). This photo was the image of the month in November of 2017. This photo was taken with a digital camera.